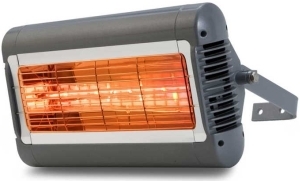 The SOLAIRA ALPHA SERIES electric infrared heaters represent the evolution of engineered short wave heating technology. Alpha Series Heaters produce short wave length infrared that convert 92% of consumed energy to instant, controllable, directional heat. 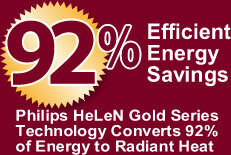 This heating technology is not affected by wind or draft as it warms people, objects and things and not the air. The modular design of the Solaira Alpha Series allows specifying engineers to adjust and direct speciﬁed heating loads based on area requirements. The Alpha Series modern, sleek design allows architects to integrate heating technology with clean un-intrusive lines. Alpha Series Heaters are engineered to meet P24 standard for water spray so they can be installed in both wet (outdoor) or dry conditions (indoor or outdoor).